Though MBA students learn how to crunch numbers with amazing acumen, one statistic may have escaped their notice: The hot job market for MBAs is even hotter for those with financial analyst concentrations. Consider the incredible career path of Stephanie Grant, a recent graduate of Florida Atlantic University's Financial Analyst program on her way to finishing her Executive MBA in the spring of 2016. "It's had a huge occupational impact," Grant said. "I was a public school teacher, and as a result of the EMBA and the FA program in particular, I'm now working as a research associate for an investment bank." That has translated to a 50% pay raise as she progresses toward getting the needed licenses. Meanwhile, two classmates have asked her to apply for jobs with their employers. "When I walked into the MBA program, I found out about the FA and that catapulted me into the financial world," Grant noted. "Both of those programs just paved the path." A survey by the Graduate Management Admission Council shows that a stunning 90% of part-time MBA students from the class of 2014 and 92% of full-timers said the degree prepared them for leadership positions. Going back as far as the class of 1959, 94% said the degree was personally rewarding, while 83% reported their graduate management education had a positive impact on their career progression. And as for those rosy career prospects, hot jobs run the gamut from information technology manager to human resources specialist, as reported by U.S. News & World Report in March. And while some of the jobs named in the MBA graduate list don't necessarily require an advanced degree (HR specialist is a good example), the master's gives job hunters a leg up on the competition — and those already in secure positions a nice bump in pay. South Florida has its own MBA-centric jobs that are in high demand. 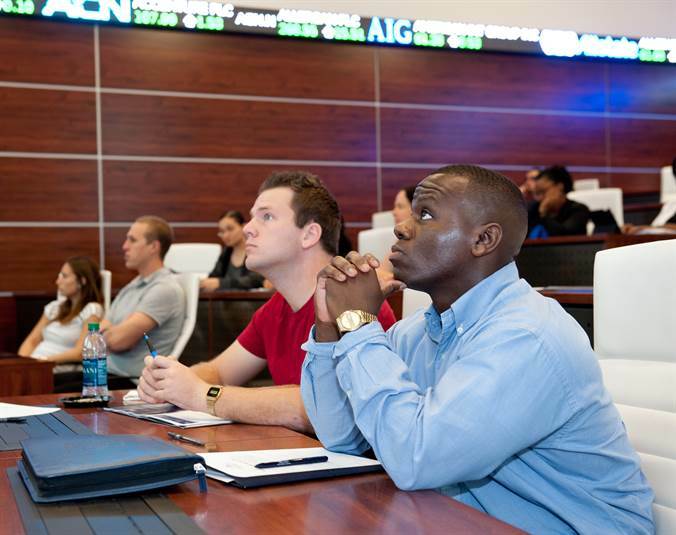 "We have a situation here with the influx of financial firms coming from the Northeast," said instructor Rainford Knight of the Financial Analyst Program in FAU's Department of Finance. "There's a shortage of talent that can come in and do the finance-related work, and demand for those skill sets in South Florida is only going to grow, given that many companies can now grow their businesses here and don't have to stay in New York City." Knight added that, in the history of FAU's program, he's also seen ample demand for workers in equity research, asset management and healthcare. Indeed, healthcare is big because of the retiree population that calls the area home. That's where Eric Moisa landed. An MBA graduate at FAU who finished the FA program in 2013, Moisa now works in healthcare finance with an employer based in Delray Beach. The job takes advantage of his computer science background, as well. "Combining all that with finance is the perfect blend," he said. If not for the programs at FAU, Moisa said he would not have found his calling. "I always saw myself as having a goal, but when I completed my bachelor's degree in computer science I felt a void," he recalled. "But after the first semester of taking finance, that's when I said, "˜Wow.' The gap I was trying to close, the satisfaction, it was all there." The GMAC survey shows Moisa isn't the only one with such high praise. Among 2014 grads, 88% said the MBA prepared them for their chosen career, while 86% reported increased earning power. Another 87% said the MBA gave them the ability to work in an international business environment. Closer to home, "You'll be better prepared for the local job market here, in my view," Knight said. "And that's the end-all-be-all. You'll be better equipped to compete and that's why you're in the program in the first place." Wondering what other job fields hold promise? Here are some positions where MBAs are especially sought after, as mentioned by U.S. News. Operations research analysts: Use statistics to identify and troubleshoot problems with production, logistics and sales. Information security analysts: Monitor and protect an organization's computer network and systems; here, an MBA is not required but preferred by employers. Management analysts: Provide feedback on improving an organization's efficiency and profitability.